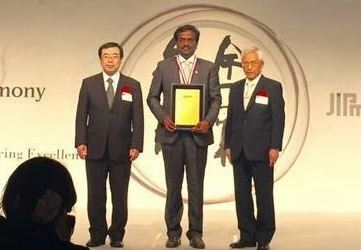 Bhubaneswar, March 25, 2016: As a mark of recognition of its excellence in best practice in Total Productive Maintenance (TPM), Pellet Plant of Jindal Steel & Power Limited (JSPL) in Barbil has been awarded with TPM Excellence Category “A” Award by Japan Institute of Plant Maintenance (JIPM) at Kyoto, Japan on 23rd March, 2016. Mr. T. S. Shanbhogue, EVP & Unit Head (JSPL, Barbil) received the award on behalf of JSPL, Barbil. Receiving the award, Mr. Shanbhogue said, “TPM has great importance and significance in pellet plants to ensure high level of operational and maintenance effectiveness. Due to the participation of total employees and effective coordination and facilitation by Mr. Bhuwan Pratap, GM (Business Excellence) TPM has become a work culture at JSPL’s Barbil Unit”. He extended whole hearted gratitude and congratulated all the employees for this achievement. On this occasion, Mr. Bhuwan Pratap said, “It has been a long journey implementing TPM in the plant and a proud moment for the company to get this world class recognition for our excellence in improvement initiative projects. This award will greatly motivate us to achieve higher benchmarks in TPM”. The Pellet Plant of Barbil unit has been selected for this international award after stringent two stage audits by JIPM Assessors; who had visited the plant in July and December 2015. It is to be noted that that JSPL’s Pellet Plant at Barbil is the first pellet plant in the world to receive this coveted TPM Excellence Award from JIPM, Japan.